The key to a great-tasting salad is using fresh ingredients. The most important ingredient in salad is lettuce, so it is critical that your lettuce is fresh and crisp. Old, wilted lettuce is unattractive and unappetizing. To keep your salads tasting great without the expense of buying fresh lettuce every single day, you should learn the best ways to clean and store fresh iceberg lettuce and other greens. Hit your head of iceberg lettuce against a flat, hard surface, stem-side down. Hold the end of the lettuce’s core and twist and pull until it comes out. Rinse the cored lettuce thoroughly under cold water. Allow the head of lettuce to dry completely. Seal the lettuce in a plastic bag and place it in the refrigerator. 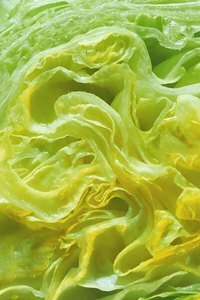 Properly stored iceberg lettuce can last up to two weeks in the refrigerator. For easy salads, chop your lettuce, rinse thoroughly and use a salad spinner to spin it dry before storing in a plastic bag. Place a sheet of paper towel in the plastic bag to absorb any moisture and remove it after the first day. Lettuce will wilt more quickly when you store it this way but it is more convenient to use. Restore slightly wilted lettuce by soaking it in ice cold water for a few minutes before making your salad. Keep lettuce away from fruits in the refrigerator. Fruits give off ethylene gas as they age, which will spoil your lettuce and other vegetables more quickly.